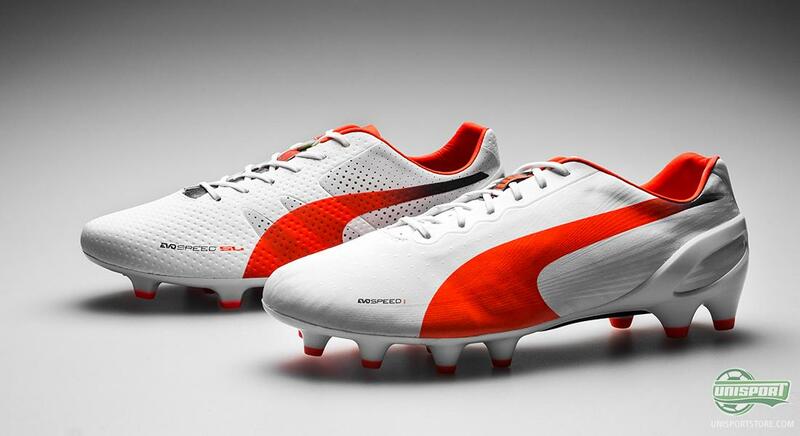 PUMA have recently launched the brand new evoPOWER football boot, but this certainly does not mean that the popular evoSPEED football boot has been forgotten. 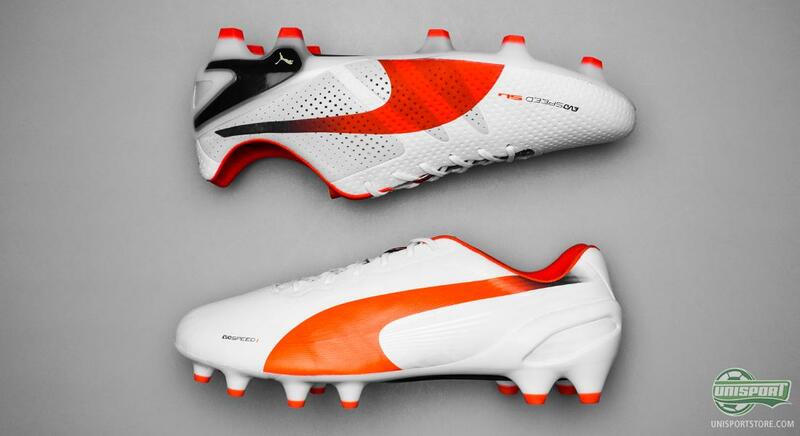 And today PUMA launch both the evoSPEED 1.2 and the lighter brother, evoSPEED 1.2 SL in a fresh white and orange colourway. 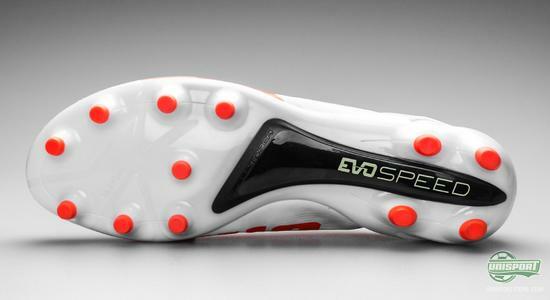 The evoSPEED 1.2 has been put into this world to do three things: Low weight, flex and fit. And luckily the boot delivers. The evoSPEED 1.2 weighs in at just 198 grams in the synthetic model, which, admitted, could have been lower  on the other hand PUMA compensate nicely with extra support and comfort. This new colourway for the PUMA evoSPEED 1.2 football boot only comes in a synthetic version. It is although a synthetic design with a Japanese piece of microfibre with a leather-like finish to provide an elegant feel. 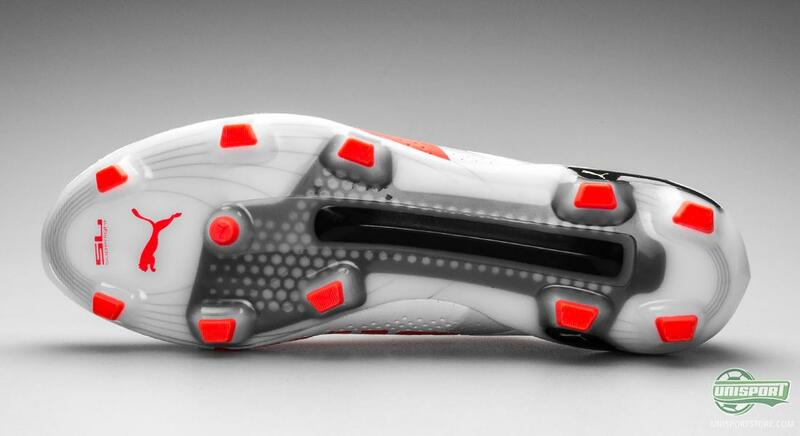 The upper is both thin and soft, and also provides a nice snug fit, as well as a precise ball feel. Not only does the upper have a feel of leather to it; it is also equipped with the PUMA GripTex-technology, which provides extra ball grip. You hereby get better ball control, even in wet conditions. In order to keep a high level of comfort, PUMA have created an anatomically correct shaped last, which follows your toes in a unique way, and provides a nice fit straight out the box. In addition, PUMA have equipped the evoSPEED 1.2 football boot with their EverFit Cage technology on the inside of the upper, which act as a skeleton in the boot, and ensures good stability to the upper and hereby keep your foot well in place. Last but not least, the evoSPEED 1.2 has been developed to follow and move with your foot as you are running, as PUMA have made use of their extensive knowledge from making running shoes, where they, among other things, have a sponsoring deal with the fastest man in the world, Usain Bolt. 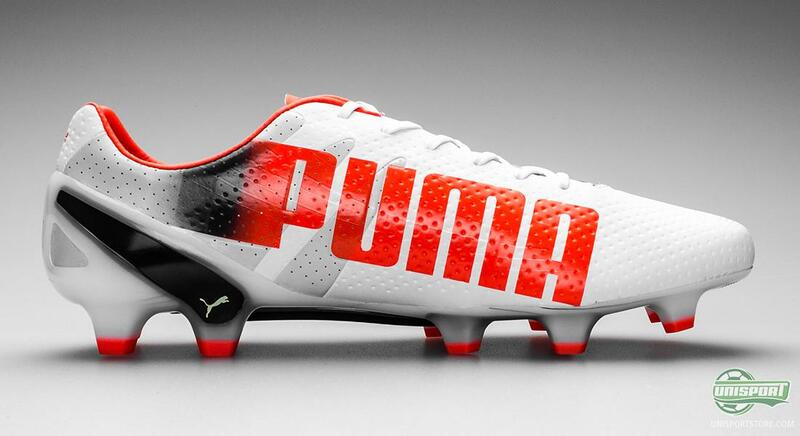 PUMA are seeking to increase the flexibility in the forefoot by adding a number of flex grooves that help you to be ready for the explosive acceleration needed to pass your opponent with a quick movement. In addition, the midfoot is stable to provide rapid power transfer from heel to toe, resulting in a boot that reacts to even the smallest movement. 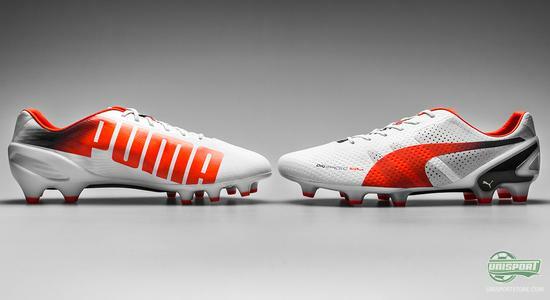 The PUMA evoSPEED 1.2 also has an ultra light little brother. The PUMA evoSPEED 1.2 SL football boot weighs in at a mere 165 grams, and is hereby among the very lightest boots on the market. It comes in the same white and orange colourway as the regular version, but is still quite different from its slightly heavier and speedy brother. 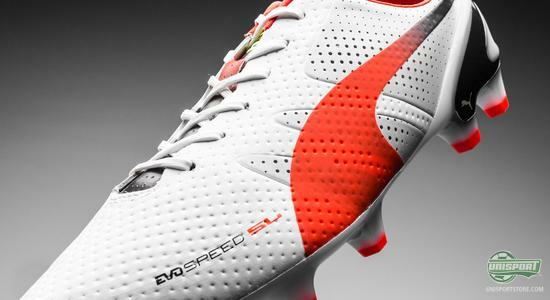 The PUMA evoSPEED 1.2 SL is made for speed and a feeling of not having anything on your feet. As previously mentioned, it weighs in at just 165 grams and hereby manages to provide that barefoot feel, which is something a lot of players value highly. 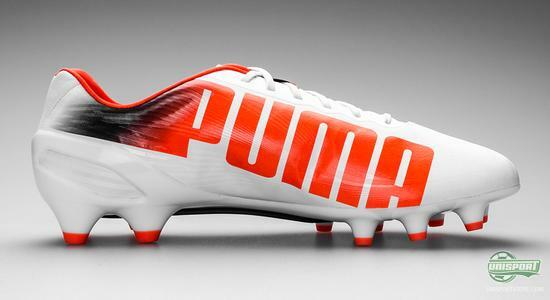 Does a football boot of just 165 grams sound tempting? We understand. You can order the PUMA evoSPEED 1.2 SL already today - 205. 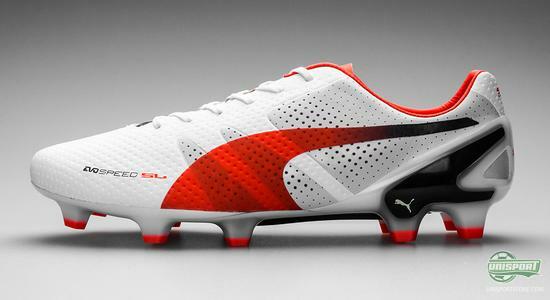 The upper on the PUMA evoSPEED 1.2 SL is made of the same Japanese synthetic as the regular evoSPEED. Although, the microfibre is slightly thinner on the SL version. In order to keep the weight further down on the upper of the PUMA evoSPEED 1.2 SL it has also been perforated. On top of the weight reduction, the perforation also provides unique ventilation for your feet. Under the sole the focus is on speed - and here we have seen a substantial improvement compared to the previous generation of the PUMA evoSPEED SL. 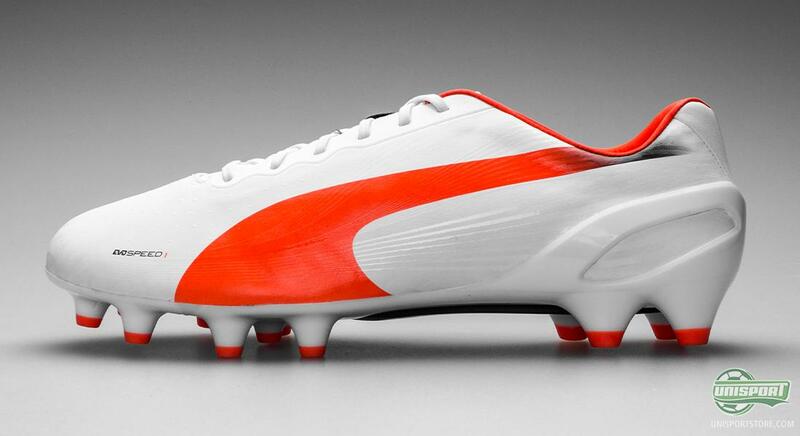 It has been brought n from the PUMA King SL, and is made of Pebax with a nylon stripe under the midfoot. This torsion bar is extremely hard, and ensures optimal use of energy in the boot. PUMA have been inspired by their running shoes for sprinters, and looked at how your foot moves during acceleration, and then brought this knowledge to the sole of the evoSPEED 1.2 SL. 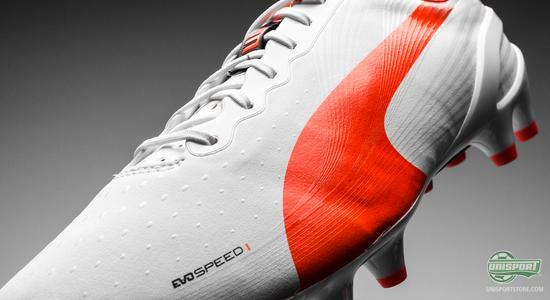 A nice new colour for the evoSPEED 1.2 which fits nicely with the speed theme. Are you into the evoSPEED boots? Do you prefer the regular or the SLS version? Take your football passion to a social level and share your comments with us on Facebook and Twitter.